When Is Windows 10 End of Life? The Windows Update page shows you if you are up to date. Microsoft will not be implementing the same end of life process for Windows 10 that it has for previous versions of Windows. There is no forthcoming Windows version to install. Instead, Windows 10 users will need to continue allowing Windows 10 to update itself indefinitely. Older versions of Windows 10 will reach end of service, but this will be largely irrelevant for users who keep Windows 10 updated. Windows 10 was developed to be an as-a-service application, meaning the user doesn’t have to worry about installing new versions or updates. The process is similar to, say, the browser that you use, which gets updated periodically without any effort on your part. These updates include regular improvements meant to make Windows easier to use. How Can I Make Sure I Have the Latest Update? Click Update & Security. You will be taken to a Windows Update screen. At the top of the screen, check your update status. If you’re up-to-date, you don’t need to do anything else. If you’re not completely updated, click Check for updates and follow the instructions from there. 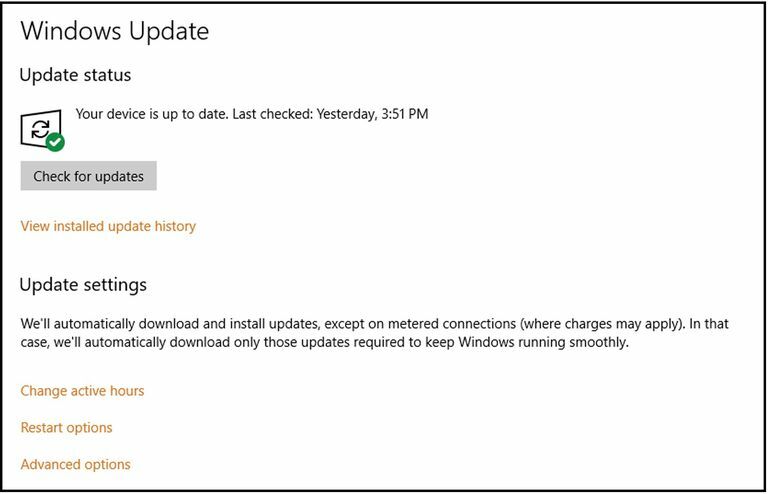 Once you’re all updated you can modify other update settings from the Windows Update screen. Just click the links under Update settings and make adjustments according to your preferences. Are You Ready for Office 2010 End of Life?